For the well-being of bones. Calcium and vitamin D2 contribute to the maintenance of the normal function of bones and teeth. Vitamin D contributes calcium absorption. Free from lactose, sweeteners and gluten. Suitable for vegans. Calcium and vitamin D are needed for the normal function of teeth and bones as well as muscles. Calcium also contributes normal blood clotting, normal nervous transmitting and the normal activity of the digestion enzymes. Vitamin D contributes the utilization of calcium and normal function of the immune system as well as maintaining the blood’s normal calcium levels. 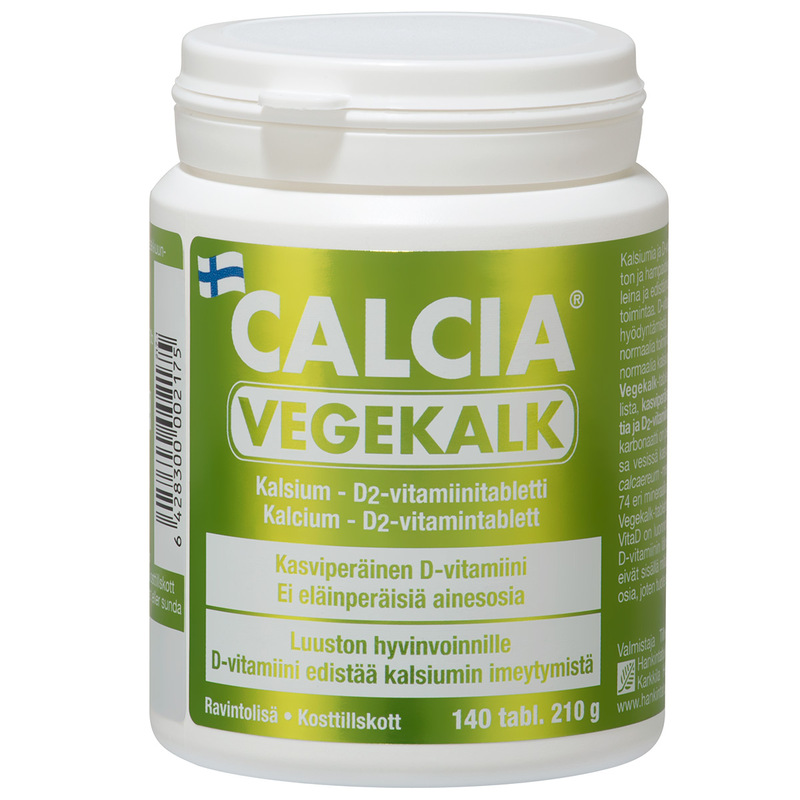 Calcia Vegekalk tablets contain natural, plant based Aquamin™ calcium carbonate and vitamin D2. Aquamin™ calcium carbonate is originated from a Lithothamnion calcareum-algae grown in the clear waters of Iceland. This algae contains 74 different minerals. Beside calcium it contains, for example, magnesium, phosphorus, zinc, boron, mangane and molybdenum. The natural Lalmin® VitaD in the tablets is non-animal based vitamin D source. It is being received by exposing Saccharomyces cerevisiae-yeast to sunlight in controlled conditions. The ergosterol in the yeast is being formed by this process into ergocalcipherol. Other useful ingredients, vitamin Bs and betaglucan, can also be found in small amounts from the yeast mass. Aquamin™ is diverse by its effect: It has been proven in clinical studies to help to reduce pain and stiffness as well as increase movement and the length of walking. It has also been shown that it helps to reduce pain of the people suffering from osteoarthritis. Aquamin™ controls inflammations generally and it has been proven it fits as support treatment during intestine inflammations. Several studies have shown, that Aquamin™ reduces the amount of parathyroid hormones. Therefore, the calcium can attach better to bones because PTH takes calcium from bones into other parts of the body. Consequently, Aquamin™ is an important source of calcium when preventing osteoporosis.